Last edited by DanRaisch on September 14th, 2018, 2:01 pm, edited 1 time in total. Reason: Email address obscured per forum rules. Irrelevant system data removed. Go to TOOLS > OPTIONS >SECURITY > PASSWORDS tab> SAVED PASSWORDS button and there you can delete the password for the account reporting the error. Restart Thunderbird to ensure that the stored password is cleared from memory. The next time you "Get Mail" Thunderbird will ask for the password and you can check the box to remember the value. .. and remember that passwords are case sensitive and should not have any extraneous spaces at the beginning or end. DanRaisch wrote: Go to TOOLS > OPTIONS >SECURITY > PASSWORDS tab> SAVED PASSWORDS button and there you can delete the password for the account reporting the error. Sir: "The next time you "Get Mail" Thunderbird will ask for the password and you can check the box to remember the value. ": It didn't ask for a password, just failed. BTW, there are some old existences of the e-mail address with different servers if long ago in the should they have been deleted? However just before the fail, it repeated the failed "removed" name so I am confused. I did fulfill your shut-down of Thunderbird & restart. The only entries in that dialogue listing saved passwords should be for current accounts. If you had accounts that are no longer valid/in use, you should remove those entries from that list. It didn't ask for a password, just failed. More detail, please. Exactly how did it fail? What error message or was there no message at all? The below is the error message received. The message could not be sent using Outgoing server (SMTP) smtp.gmail.com for an unknown reason. Please verify that your Outgoing server (SMTP) settings are correct and try again." You can't "set" passwords in Thunderbird. You can only enter the correct password value when it is requested. It sounds as though the settings you have for the SMTP server for that account are not what they should be so the server is not asking for the password. DanRaisch wrote: You can't "set" passwords in Thunderbird. You can only enter the correct password value when it is requested. It sounds as though the settings you have for the SMTP server for that account are not what they should be so the server is not asking for the password. 1.What's normal password? 2. Where do I get it? Where do I enter it? What's Connection Security -- SSL/TLS, etc. You misunderstand. That does not refer to any particular password value. It's a selection from the drop down list of options for the Authentication Method to be used when Thunderbird communicates with the server. Selecting that option in the settings dialogue will cause TB to ask you for the password for the account, the same password you would enter if you were accessing the Gmail web page using a browser. DanRaisch wrote: You misunderstand. That does not refer to any particular password value. It's a selection from the drop down list of options for the Authentication Method to be used when Thunderbird communicates with the server. Selecting that option in the settings dialogue will cause TB to ask you for the password for the account, the same password you would enter if you were accessing the Gmail web page using a browser. You don't do that through Thunderbird, do you? You're referring to accessing that site through a browser? DanRaisch wrote: You don't do that through Thunderbird, do you? You're referring to accessing that site through a browser? Correct sir. I was hoping that would give me entrance/correct the problem. Did you confirm that the settings you have for the SMTP server for that Gmail account match the values I posted above? DanRaisch wrote: Did you confirm that the settings you have for the SMTP server for that Gmail account match the values I posted above? 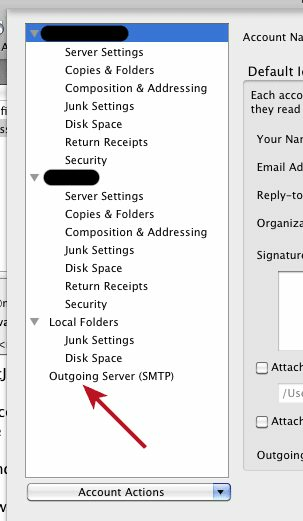 Try menu path Tools->Account Settings->Outgoing Server (SMTP)->click on the name of the Gmail account at top right then click on the "Edit" button.